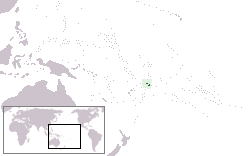 Location of Western Samoa in Oceania. Western Samoa Mandate then Western Samoa Trust Territory were the official name of Western Samoa during its civil administration by New Zealand between 1920, six years after that country had terminated the German rule, and Samoan independence in 1962. The Union Flag raised in Apia, 30 August 1914. During World War I, New Zealand was a British dominion while German Samoa was a German colony. Both territories, therefore, became involved in the war. On 7 August 1914, the British government indicated that the seizure of a wireless station near Apia, the colony's capital, which was used by the German East Asia Squadron, would be a "great and urgent Imperial service"; this would be followed by the first action of New Zealand in the war, the sailing of a Samoan Expedition Force on 15 August, which would land at Apia two weeks later. Although Germany refused to officially surrender the colonies, no resistance was offered and the occupation took place without any fighting. However the first seizure of a German colony was four days earlier (Togoland, captured as part of the West Africa Campaign), despite claims that German Samoa was the first enemy territory to fall to imperial forces. Colonel Robert Logan, who had commanded the Samoan Expeditionary Force, was the military administrator of the colony for the remainder of the war. By 1918, Samoa had a population of some 38,000 Samoans and 1,500 Europeans. Approximately one fifth of the population died in the Influenza epidemic of 1918–1919. In 1919, The Royal Commission of Inquiry into the Epidemic concluded that there had been no epidemic of pneumonic influenza in Western Samoa before the arrival of the 'SS Talune' from Auckland on 7 November 1918, which was allowed to berth by Logan without quarantine precautions; that within seven days of this ship's arrival influenza had become epidemic in Upolu and had then spread rapidly throughout the rest of the territory. On 17 December 1920, the League of Nations conferred a Class C Mandate over the former German Colony of Samoa to the Dominion of New Zealand. 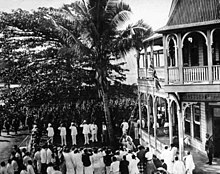 On 1 May 1920, the Samoa Constitution Order, 1920 replaced the military occupation with a civil administration. On 1 April 1922 the Samoa Act 1921 came into force. Under the Samoa Act the New Zealand Governor-General appointed an Administrator based in Apia to hold executive power, who reported to the New Zealand Minister of External Affairs in Wellington; lawmaking power was held by the Administrator and a local Legislative Council, although Wellington had final authority. After 1945, this classification of the mandate was changed to a United Nations Trust Territory. The Mau (literally translates as "strongly held opinion"), a non-violent popular movement which had its beginnings in the early 1900s (decade) on Savai'i and was led by Lauaki Namulauulu Mamoe, an orator chief deposed by the German Administration. The 1920s saw the resurgence of the Mau, this time in opposition to the New Zealand administration. One of the Mau leaders was Olaf Frederick Nelson, a half Samoan and half Swedish merchant. Nelson was exiled by the Administration during the late 1920s and early 1930s, but he continued to assist the organisation financially and politically. on 28 December 1929, the newly elected leader, High Chief Tupua Tamasese Lealofi, led his fellow uniformed Mau in a peaceful demonstration in downtown Apia. The New Zealand police attempted to arrest Chief Tamasese. When he resisted, a struggle developed between the police and the Mau. The officers began to fire randomly into the crowd and a Lewis machine gun, mounted in preparation for this demonstration, was used to disperse the Mau. Chief Tamasese was shot from behind and killed while trying to bring calm and order to the Mau demonstrators, screaming "Peace, Samoa". Ten others died that day and approximately 50 were injured by gunshot wounds and police batons. That day would come to be known in Samoa as Black Saturday. The Mau grew, remaining steadfastly non-violent, and expanded to include a highly influential women's branch. After repeated efforts by the Samoan people, Western Samoa gained independence in 1962 and signed a Friendship Treaty with New Zealand. Samoa was the first country in the Pacific to become independent. In 2002, New Zealand's prime minister Helen Clark, on a trip to Samoa, formally apologised for New Zealand's role in these two incidents. ^ Smith 1924, p. 14. ^ McGibbon 2007, p. 65. ^ Munro, Doug. "Robert Logan". Dictionary of New Zealand Biography. Ministry for Culture and Heritage. Retrieved 30 September 2016. ^ Albert Wendt. "Guardians and Wards: (A study of the origins, causes, and the first two years of the Mau in Western Samoa.)". ^ a b c "New Zealand in Samoa: Colonial administration". NZHistory. New Zealand Ministry for Culture and Heritage. Retrieved 27 December 2015. ^ "League of Nations Mandate for German Samoa". NZHistory. New Zealand Ministry for Culture and Heritage. Retrieved 27 December 2015. ^ Samoa Constitution Order, 1920 (1 April 1920; N.Z. Gaz. 1920, p. 1619). Treaties of Peace Act 1919 (29 October 1919; 10 GEO V 1919 No 20); "[...] The Governor-General is hereby empowered to make, by Order in Council, such provisions as he deems necessary [...] for the government of the said Islands of Western Samoa[...]". The Western Samoa Order in Council, 1920 (11 March 1920; Statutory Rules and Orders 1920, vol 1, pp 745–746; Gazette, 21 May 1920, p 1819; 113 BFSP 18). ^ "Imperialism as a Vocation: Class C Mandates". Retrieved 23 August 2011. ^ "The Mau Movement" (PDF). Archived from the original (PDF) on 1 December 2007. Retrieved 27 November 2007. ^ "New Zealand's apology to Samoa". ^ "Prime Minister Helen Clark's Historic Apology". Field, Michael (2006). Black Saturday: New Zealand's tragic blunders in Samoa. Auckland, N.Z. : Reed Publishing (NZ). ISBN 0-7900-1103-4. McGibbon, Ian (2007). "The Shaping of New Zealand's War Effort, August–October 1914". In Crawford, John; McGibbon, Ian (eds.). New Zealand's Great War: New Zealand, the Allies & the First World War. Auckland, New Zealand: Exisle Publishing. pp. 49–68. ISBN 978-0-908988-85-3. Smith, Stephen John (1924). The Samoa (N.Z.) Expeditionary Force 1914–1915. Wellington, New Zealand: Ferguson & Osborn. OCLC 8950668. This page was last edited on 12 February 2019, at 15:33 (UTC).